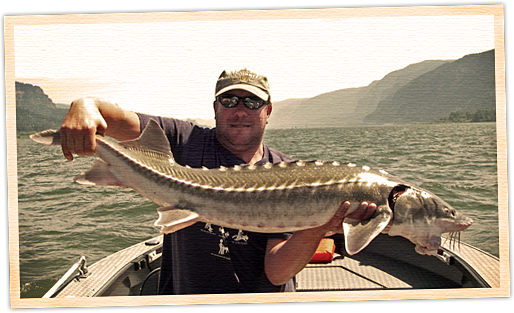 The best sturgeon fishing on the planet is right here on the Columbia River. An estimated 2 million sturgeon inhabit the Columbia River, making it the largest population in the world. Sturgeon have earned the nickname “living fossils” as they have remained largely unchanged for the last 200 million years. Instead of scales, sturgeon have thick skin and bony plates called scutes. Their skeletal structure is largely cartilage and they use four barbels which hang in front of their toothless mouths to detect their food. The majority of sturgeon migrate back and forth from the Pacific Ocean to the Columbia River and feed on freshwater clams, lamprey eel, anchovies, smelt, shad, salmon and steelhead. 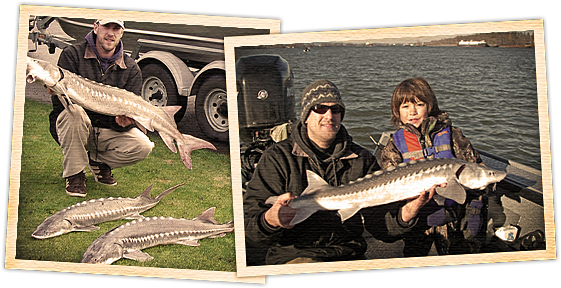 Sturgeon fishing is excellent all year round on both the Columbia River and the Willamette River near Portland, Oregon. For angling purposes, sturgeon are classified into three categories: shakers, keepers, and oversize. Columbia River & Portland, OR Keeper Size Sturgeon Fishing (Year-Round) – Legal size sturgeon from 38″ to 54″ are available to catch and bring home for the table. These are some of the best eating fish around and provide non-stop action when combined with the undersize “shakers” or sturgeon under 38″. These fish are excellent fighters and during a hot bite it is not uncommon for four or five rods to get bit at the same time. 10-30 fish landed per day is the norm with some days resulting in double that amount. 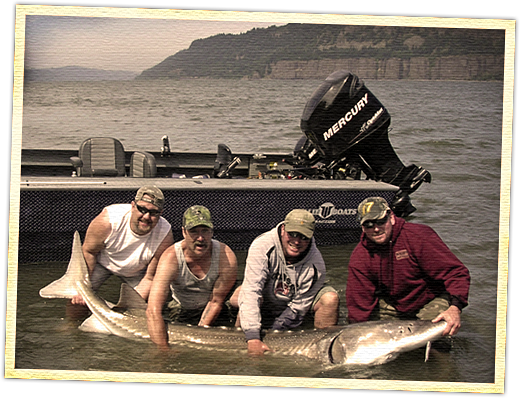 We offer guided fishing trips for keeper sturgeon in the Columbia River Gorge and the Portland, OR area all year long. 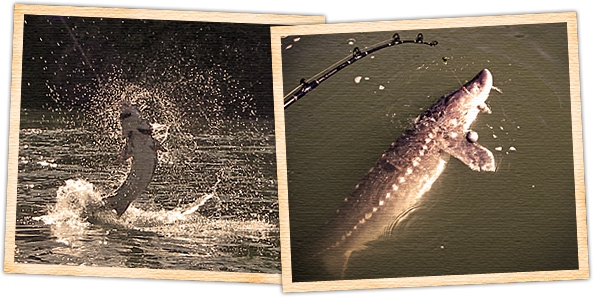 Columbia River Oversize Sturgeon Fishing (Year-Round) – These giants are North America’s largest freshwater fish and can grow over 20 feet long and 1800 pounds. The largest sturgeon officially recorded in the Columbia River was a 1,287 pound behemoth caught near Vancouver, Washington and a 1,285 pound monster taken in Astoria, OR. Today the average Columbia River oversize sturgeon will range from 6 to 14 feet long and weigh up to 500 pounds. When hooked oversize sturgeon will often jump into the air, a sight which you will be completely unprepared for. The fight can last 30-45 minutes and will test the endurance of even the strongest anglers. For most people this will be the largest fish they will ever catch in their life. A true big-game experience found only here in the Pacific Northwest.